The game came out last October, in fact, but I admit I didn't notice at the time. It's yet another primary colored F2P anime MMO. Who can keep up with them? Who even tries? So, why did I download all 3.5GB of it yesterday and spend half an hour making an Aeria Games account and patching the thing up? I blame Noizy. I play a little free-to-play (F2P) game called Dragomon Hunter. During a long weekend spent making instawarp bookmarks in lowsec, running around an anime world gathering resources, doing dailies, and tending the creatures on my ranch for an hour or so is a nice break. For some reason that description caught my fancy. Noizy went on to say that the game hasn't been as successful as it might have been. The two U.S. servers have just been merged. The game might not be around forever. There's nothing like a little artificial scarcity to drum up interest. It seemed like a good idea to have a look now, when I had a free afternoon. Probably going to be one of the many bright and breezy imported MMOs I play for a couple of hours then uninstall and never think of again. Dragomon Hunter is...odd. It looks great, if very busy, in the way of its peers. Everything is big, bright and vibrant. It feels like stepping inside a cartoon or, I suppose, an anime, although I wouldn't know about that. I don't watch anime. Never have. To me it feels like stepping through the screen into a Saturday Morning cartoon circa the mid-90s. That much I expected. What I wasn't ready for was the text. The sophistication. The quality. The irony. The metatextuality. The sheer bloody volume! 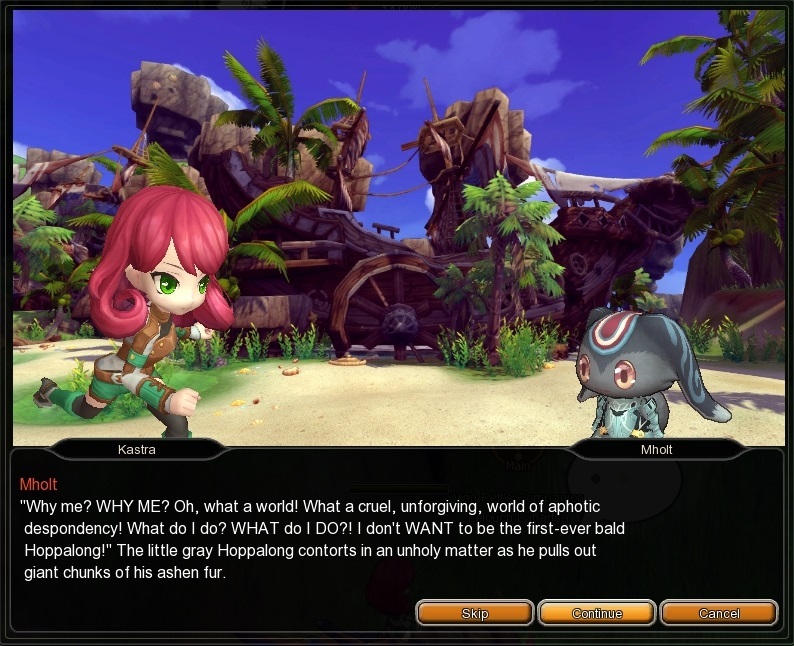 When it comes to the written word, what I expect from MMOs in this niche is poorly translated piffle. Dragomon Hunter offers neither. What we have here is rich and quite strange. For one thing, who writes quest dialog in reported speech? It's like reading the intertitle cards from a silent movie. For another, who uses vocabulary like this in what looks, on the face of it, to be a video game for younger children? 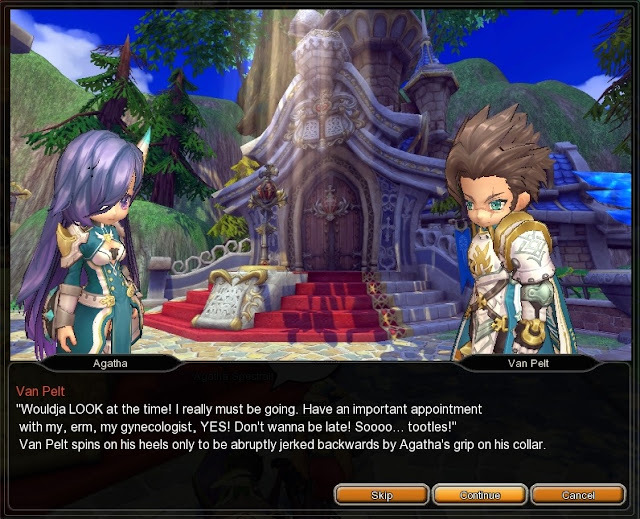 "Gynecologist" ? "Emasculated" ? "Aphotic" ?? I had to look that last one up and it's not only used correctly here but correctly and poetically. The quests all come with a "Skip" or "Continue" button. In the early stages of the tutorial the "Skip" button flashed at me imperiously and repeatedly as if to say "Come on, now! Surely you don't want to read this stuff?" But I did. I really did. I couldn't get enough of it, which was fortunate because the game couldn't wait to give me more. I read page after page of genuinely interesting, amusing information about rabbits with hair loss and self esteem issues. I probed what appeared to be subtext concerning gender identity and domestic abuse. I tried and failed to perform practical criticism on reams of royal rabbit poetry. The words just kept coming. I played for a couple of hours then took a break but when I logged out of GW2 a while before bedtime I chose not to go to EQ2 but back for more. The gameplay seems good, too. I certainly enjoyed it. The USP would seem to be catching mounts to ride in some kind of Pokemon fashion. Like anime, Pokemon is another world to me, one I've only read about, so maybe that's not a good point of reference but it's what came to mind. The controls were awkward at first. 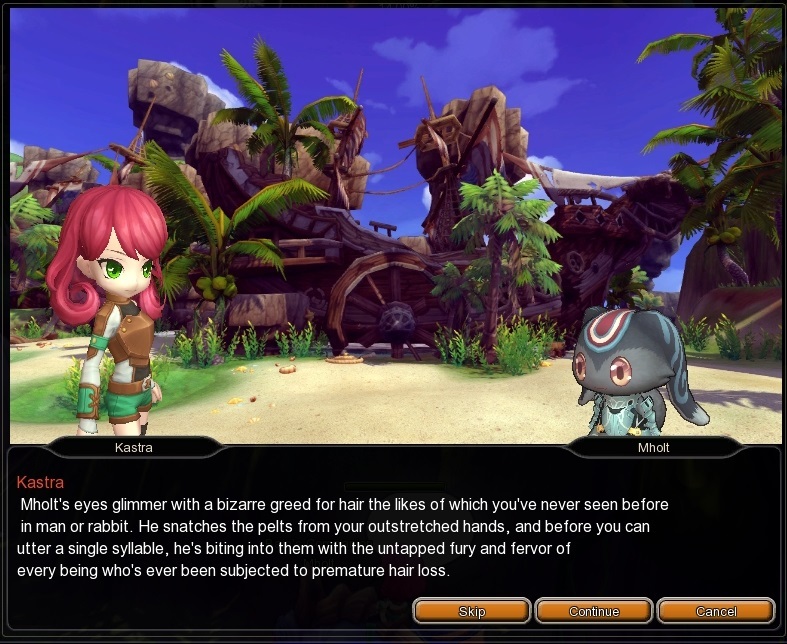 The game can be played in traditional MMO hotbar style, as a cross-hair, center-screen ARPG or with a console-style controller. Naturally I plumped for the trad version but I was thrown by the unusual choice of right-click rather than left to activate the hot keys. Once I'd begun to get used to that everything went swimmingly. I did quest after quest, for which the rewards were exceptionally generous for a F2P of this stripe. All my gear was constantly being upgraded, which isn't unusual, but in the first three or four hours of play a temporary mount, one of the 100+ eponymous Dragomons, dropped and quests gave me two permanent ones. Crafting mats and all kinds of goodies I don't yet understand fell into my inventory, some of them from the eccentrically named boss mobs I ran into and managed to kill (an otter called Jembrandt P Smith? A lizard named Klep "The Voice" Oswald??) They didn't die without a struggle, either, let me tell you. It was a lot of fun. 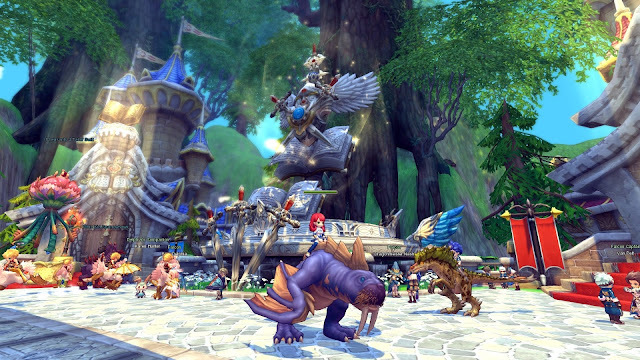 Noizy says "when I want to just putter around and not worry about death, Dragomon Hunter is a nice place to visit." On first blush I'd have to concur. 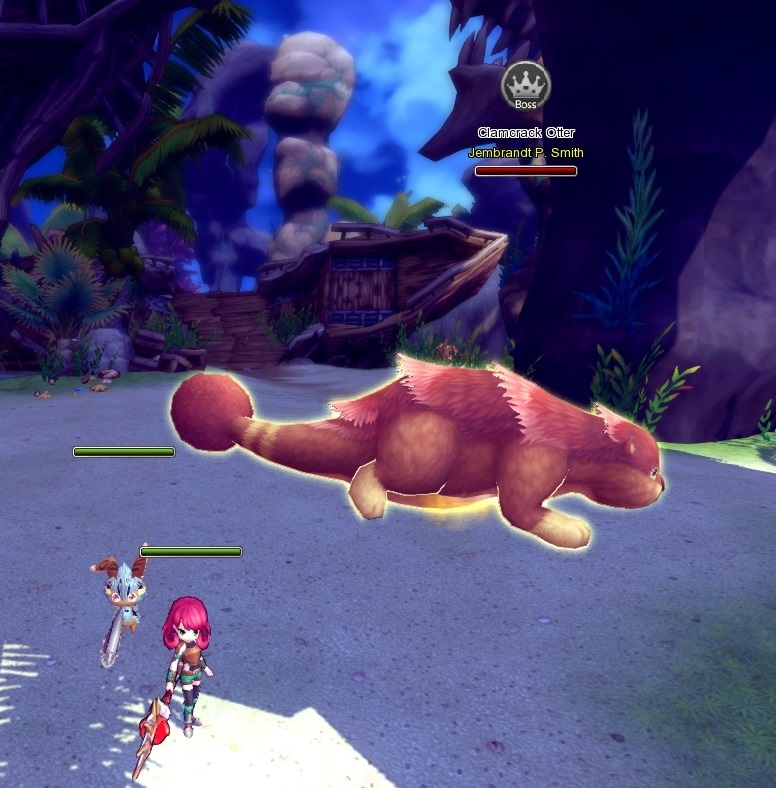 To that I'd add, if you ever find that you can't quite decide whether you feel like reading a book or playing an MMO, then Dragomon Hunter might be the very game for you. Woah, the quality of the writing is actually.... good? It feels like a cross between a RPG and a Visual Novel, which would explain why it is so niche. There's actually a typo in the first dialog shot that I didn't notice at the time - they have "matter" where they mean "manner". Apart from that both the writing and the proof-reading is above MMO average I'd say.